The best time to observe Mars this year is happening right now, from late July through early August 2018! Mars will making its closest approach to Earth in the coming weeks, and will be at its absolute brightest from July 27-31. Mars will be at its closest approach, and appearing its largest size through telescopes, on July 31! Mars will be close enough during this approach that backyard telescopes can offer up decent views of Mars' surface features, like its highlands, lowlands, white polar caps, and possibly some light wisps of clouds. A large dust storm is currently raging across the face of the planet, which has obscured many of these details, but thankfully the storm's intensity seems to be fading just in time for up close observing. That's one quirk of Mars watching: astronomers not only have to worry about the weather on Earth potentially interfering with their telescope's view, but also the weather on Mars! Where can you find someone with a telescope eager to share a peek at Mars? At a star party sponsored by your local astronomy club! You can find events near you on our event page, where clubs across the USA post their public events for curious folks to find and join in! Unable to observe through a telescope? Would you like to join folks from around the world on a live stream for some serious Mars observing sessions? You're in luck! On July 30-31, 2018, folks from NASA’s Mars Exploration Program and NASA-TV will be Livestreaming a free virtual Mars observing party from Griffith Observatory in Los Angeles! The stream will broadcast from 10:00 p.m. to 1:30 a.m. Representatives from Mars missions, including recently launched InSight, Mars Exploration Rovers, and the Mars Science Laboratory (AKA Curiosity) will join the broadcast to give updates of their respective Martian missions. You can check out the stream here and sign up for updates. 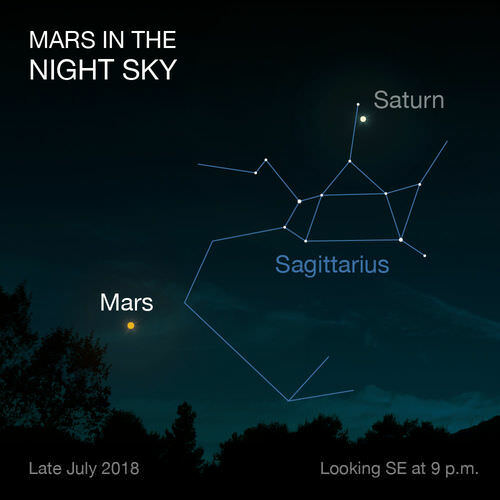 Look for Mars in the southeast near Sagittarius after sunset; as a bonus, Saturn is nearby! Image courtesy NASA. How can you find Mars? To the unaided eye, Mars will look like a brilliant bright star in the night sky; you won't see it looking as large as the Moon by any means! Mars will still appear extremely bright and reddish-orange in color; some observers say its almost salmon in hue. Look for it near the "teapot" of the constellation Sagittarius in the southeastern sky shortly after sunset. Why are these close approaches of Mars so special? That' due to Mars' relatively small size! Its orbit can bring it over 249 million miles away from us here on Earth, and even its average distance is still very far faway at around 140 million miles distant. This combination of small size and large average distance is why Mars's disc often appears tiny, even when using powerful telescopes. 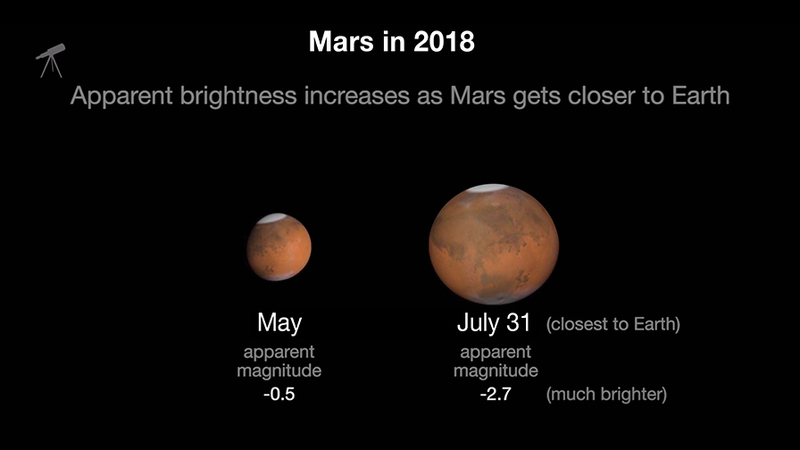 This year's approach will see the red planet come to around 35.8 million miles from Earth; much closer than its average distance, and much nearer than many of its previous approaches. That's why the views are so much better than average duing these precious few weeks. So go find Mars! Check out a local star party and treat your eyes to Mars along with many other beautiful astronomical sights. You can also look up more information about viewing Mars on NASA's Mars Close Approach page. JPL has a great What's Up stargazing video for July featuring tips on spotting Mars, too. Close approaches of Mars and Earth occur a roughly every 26 months, and so the next approach will be in October 2020 - the same year that NASA will launch its next Mars rover.